The annual Perseid Shower put on an unusual show in August 2018 with comet 21P/Giacobini-Zinner nearby. Following detection of a spiral meteor through the Heart Nebula during the 2016 Perseid meteor shower, I elected to run several cameras with longer focal lengths than is usually done by meteor photographers. 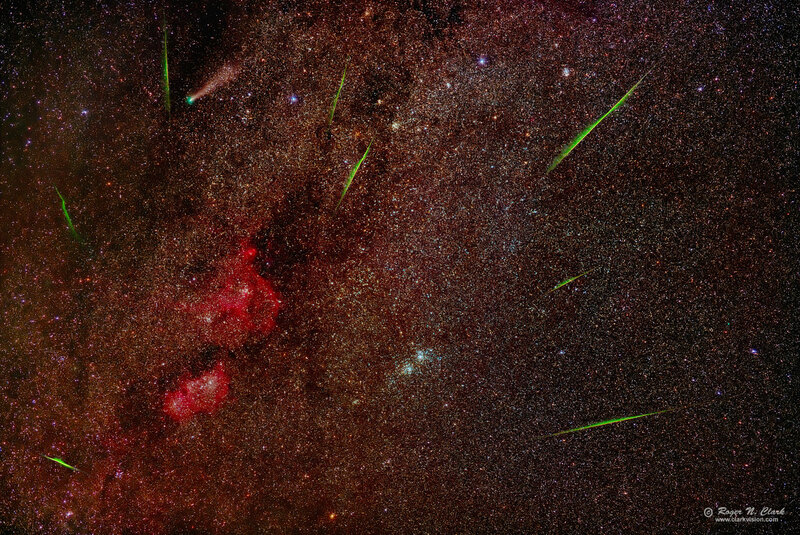 In the image, meteors are green, hydrogen emission nebulae are red, the star clusters are varied in color from bluish (hot young clusters) to yellow and orange (older cool stars). Comet 21P/Giacobini-Zinner is at upper left, showing a blue-green head from carbon emission, with a brownish dusty tail. Interstellar dust is burnt-orange and shows throughout the scene in this natural color image. The idea for using longer focal length lenses was to get some statistics on how many meteors rotate as they enter the atmosphere. The answer is that every meteor I captured with 100+ mm focal lengths show apparent rotation. Other comparable images that I have seen online also show apparent rotation. Thus rotation is common. The new amazing Sigma 105mm f/1.4 DG HSM Art Lens provided this stunning image. Technical. This image was obtained with a Canon EOS 6D Mark II DSLR Camera and Sigma 105mm f/1.4 DG HSM Art Lens at f/1.4 and ISO 1600. No dark frame subtraction, no flat fields. Tracking with a Fornax Lightrack II and no guiding. The total exposure was 50.5 minutes (one-hundred-one 30-second exposures). This image is the full frame after stacking. The full resolution image plate scale is 11.2 arc-seconds per pixel. The image presented here is at 45 arc-seconds per pixel. Post processing: Raw conversion with Rawtherapee with settings tuned for astrophotos, including maintaining star color in saturated stars. Output color space was Rec.2020 to match the future of high dynamic range TVs. Look for a future article on this topic. Stretched with rnc-color-stretch. Also see Astrophotography Image Processing Basic Work Flow. CEFA = 280,000 minutes-cm2-arc-seconds2 (11.2 arc-seconds / pixel). Index to objects in the scene..
Modern DSLRs like the 6D Mark II include on sensor dark current suppression and low fixed pattern noise at ISOs around 1600 and higher, making no need for dark frame subtraction. Modern raw converters correct for light fall-off and also correct for hot/dead/stuck pixels. This makes processing low light images easy: simply align and average. Larger image, 1379 x 2062 pixels, 1.9 megabytes.